I have a penchant for hats at the moment and the newest one in my collection is this Varsity style one from ASOS. I absolutely adore the colour and the fact it has a L on it makes it even better in my books. Nothing like something with your initials on! I don't know if it comes in any other letters, I've noticed ASOS are strange for this and do some letters for some things and none for others. So maybe this post is only helpful if you have a L name! It's my birthday tomorrow if anyone is interested! I shall be reaching the age of 23, celebrating with some of the best people I know and having the best time. If I ever plan what I actually want to do! I keep getting questioned about it but I still haven't a single clue of what I actually want to do for it! I hate birthday planning. I did want this ridiculously over the top Toddles and Tiaras come My Big Fat Gypsy Wedding come My Super Sweet 16th Party but I decided it would be wiser to save my money and not blow it all on some party. Even though it would have blatantly been the part of the century! love the hat! wish i suited them, you look lovely! Love the color of the hat! Happy *early* birthday! I can't believe you're only 23 and you've already achieved so much. Can you do a post on how you gained so much blogging success? I love beanies! Can't believe over here in the UK we can still get away with wearing them, wish summer would hurry up and arrive. Happy Birthday tomorrow, I'm sure you will have a lovely day! I love your blog, I check it almost everyday. the beanie looks gorgeous on you! it looks amazing! I saw this hat on ASOS and kind of wished they had an M one for me! We love the oxblood Lily! Love that beanie. Even though my name starts with an E I would so wear it. what nail varnish are you wearing? such a gorg colour! Love the hat Lily! Happy birthday for tomorrow! Remember, nobody likes you when you're twwwweeenty three!! <3 Blink ha! You look fab though as per! yes! a hat with an L on it! perfect! Love the hat. Happy Birthday for tomorrow! This colour looks so good on you Lily! you always look so amazing in hats, i'm so jealous! if i ever try and put a hat on they're either too small, too big or don't look right on me at all! 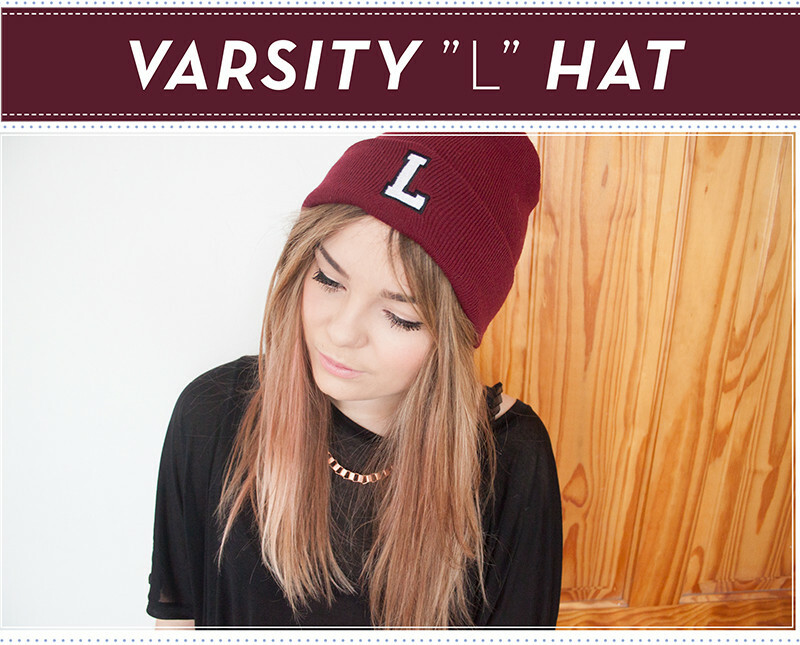 i hope ASOS bring out some more lettered hats though because i'd really like one! they look so lovely! Someone had to do it, right? Happy birthday Lily for tomorrow! I hope you have a fabulous day with the amazing people! 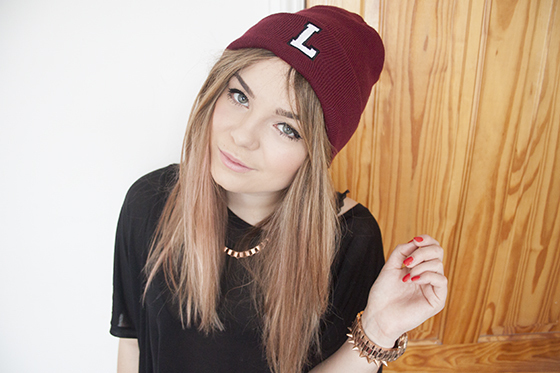 I love the ASOS beanie, and I'm one of the few that never get their initials in. I have been looking for a nice wine beanie for ages but any of the ones i've seen say 'nerd' or 'homme' etc. Definitely picking one of the ASOS ones up. Have a fabulous day tomorrow Lily, Happy Birthday! perfect beanie, need one with my initial letter! Loving the beanie, really want one now! I've just started my own blog and would love it if you could have a little look. ps.HAPPY FREAKING BIRTHDAAAAAY, hope you're getting crunk and drunk! I LOVE this, may have to purchase one myself! So pretty, love your beanie! Love the beanie, it suits you so well! I have this beanie - I bought it when it first came out, I think maybe January? And I just wanted to say a) I'm so happy my choice has been validated by one of my fave bloggers & b) I have pulled twice in it. Everyone wants to know what the 'L' stands for. I tell them: 'lovely'. Router table a whole lot simpler, as well as we desire Finest Router Tables of 2017 - Comparison This router table works with inflexible table saws. Authorities links are available to get range on any device with wifi. Charter Spectrum Login – www.Spectrum.com Offered programs is based upon your Spectrum TV registration plan. Really nice and the information shared is good and is explained in simple words. It will definitely be useful for many people. Kindly keep update like this.